Philip was born in Arabia in the town of Shabba which would lead to the later name of Philip the Arab. 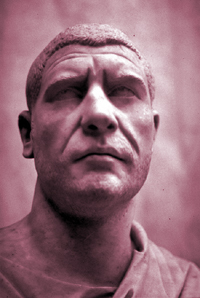 He was born to a Roman citizen Julius Marinus and was married to Marcia Otacilia Severa and they had a son named Marcus Julius Severus Philippus. More importantly he had a brother by the name of Gaius Julius Priscus who served in several prominent offices including praetorian prefect under the young emperor Gordian III. His relationship with Priscus may have helped the relatively obscure Philip rise in the ranks very quickly and he joined his brother as his colleague in the prefecture. They served with Gordian III in his failed campaign against the Persians in Mesopotamia and although reports conflict, it is believed that Philip and his brother Priscus were responsible for the emperors death while in retreat. Whether Philip and his brother had a hand in Gordians death or not did not matter, most believed they did. It is unknown why Philip would be made emperor instead of the more experienced and prominent Priscus but in reality the brothers unofficially split the empire, Philip would travel to Rome to be declared emperor by the senate and Priscus would take complete control of the eastern provinces. After striking a deal with the Persians that amounted to a payoff or possible tribute, first in a series of concessions that would contribute to discontent in the military, Philip was proclaimed emperor some time in 244. Philip then proclaimed his son Caesar and eventually his colleague at a very young age. Philip found himself at the head of an empire under attack from all sides and from within. No less than four other men revolted against his rule proclaiming themselves emperor, none seem to have been successful. There were attacks on Roman settlements on Moesia, revolts in the east possibly due to his brothers harsh policies and which possibly cost Priscus his life, and a failed conflict with the Moors that ended with Philip again 'paying off' the enemy, an act equal to defeat in the eyes of the army. After indecisive battles and losses the troops along the Danube were dissatisfied with what they saw as weakness and failures in leadership and threatened to revolt. Philip sent Decius, a man of consular rank who had served as governor of the region as well as being a native of the Illyrian provinces, to take charge, quell any uprising, and provide strong leadership there. Unfortunately for Philip the troops are said to have prompted a reluctant Decius to instead take the imperial power and proclaimed him emperor. In 249 Philip moved to take out Decius, a veteran soldier, in battle. Philip lost the conflict and his life. Upon his death his young son and heir was also killed. Under the 5 year reign of Philip, Rome celebrated its 1,000th year since its legendary founding in 753 B.C. with grand spectacle, games, and theater productions. Philip I was succeeded by Trajan Decius.